The same durability and safety built into the standard Warrior GlowTape line of schims and patchs is available on a custom basis too. Armed forces divisions and civilian enforcement units can benefit from the increased visibility of their specific logo or ID mark in IRR night vision reflectability. The flexibility of the Warrior Glo Tape manufacturing process makes customization simple and cost effective. 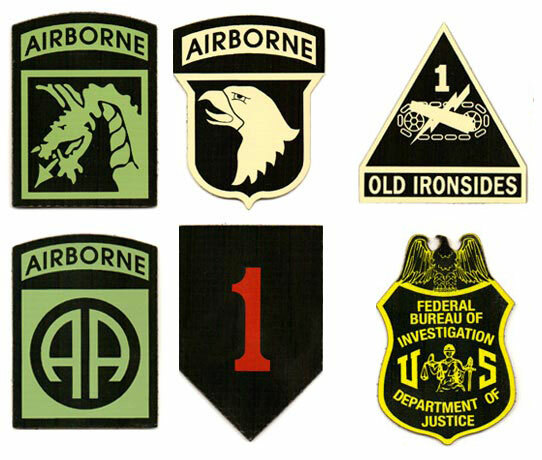 Logo or division mark must be recognized and supported by the U.S. armed forces or their civilian equivalent. Examples to the right show only a small portion of the potential Warrior GloTape marker potential. To inquire about aquiring custom Warrior GloTape markers, please fill out this form. Orders placed within North America are shipped UPS from our Florida distribution centre within 2 Business Days of receiving the order. If you select a shipping option during checkout that does not include tracking, you accept complete responsibility for the shipment. Cejay Engineering will not be responsible for items lost in transit if a non-tracked shipping method is used. Signature confirmation MAY be required for high value orders to confirm delivery. If a package tracking shows either delivery confirmation or signature confirmation - you are responsible for the item. UPS shipping times are based on non-holiday business days. Weather may delay shipping time frame. Cejay Engineering offers UPS Express International Shipping . UPS Express International Shipping is traceable. Shipping cost is calculated by the website based on your delivery address at the time of order. All packages will be declared accurately. It is ultimately the purchaser's responsibility to know your countries guidelines before making a purchase. We are not responsible for any delays or return service charges. All taxes, and duties are the responsibility of the receiver. For customers that do not wish to incur the cost of UPS Express Shipping, we recommend that you sign-up for professional Package Forwarding such as Shipito.com. This package forwarding service allows international customers to use a convenient and secure US-based address for shipments when shopping with US based sellers. Shipito.com will provide a US address, securely receive the package, notify you and ship it to you as you direct. Shipping methods that are offered by the service include: USPS Express, Priority, Air Mail, FedEx and DHL. Rates are extremely competitive and allow for full control of the shipment. Cejay Engineering is not affiliated with Shipito.com. Cejay Engineering is not responsible for packages damaged, or lost, by Shipito.com, or any other freight forwarder. Do you have ordering questions? Please Contact Us. At Cejay Engineering we strive to provide superior customer service and quality for our customers. We realize that online or catalog purchases are not always what you expect when you receive them. We will accept returns for up to 15 days from the date of original purchase date listed on your invoice. Returned products must include the original packaging, plus any accessories or extras that may have been included with the product, and be in unused condition. Any products returned with signs of wear, damage or missing accessories, while in possession of the customer, will prohibit your return. To request a return, please complete a Product Return Request at our website located at www.cejayengineering.com. If you are having trouble completing a Product Return Request, please contact us from anywhere in the continental United States at (888) 584-3060. International callers please use (239) 349-2336. Cejay Engineering, LLC, at its election, will charge a 20% restocking fee for retail sales. Dealer sales are final. You must request a Return Material Authorization (RMA) number from us before you can return a product. Cejay Engineering Featured in "The Go Bag"
Copyright © 2014 - Cejay Engineering - All Rights Reserved. Site by Amherst Partners, LLC of Amherst, New Hampshire (ST1).